The HP Deskjet 2549 All-in-One colour multifunction printer uses thermal inkjet technology and a 2-cartridge system (black and tri-colour) to print eye-catching graphics or text. An affordable choice for office users, the Deskjet 2549 All-in-One is popular thanks to its low running costs and versatility. The Deskjet 2549 multifunction printer has print, copy and scan capability. It weighs 7.9 Ibs and comes with a one year warranty from the manufacturer. Maximum print resolutions are 600 x 600dpi for mono or 4800 x 1200dpi for colour. First print out time takes 17 seconds in black and white while the input / output trays hold 60 / 25 sheets, respectively. 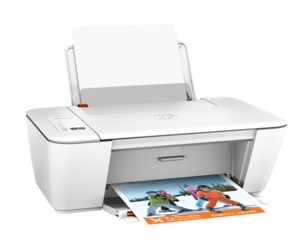 Print speeds for the All-in-One Deskjet 2549 MFP can reach 20ppm in mono or 16ppm in colour. The option to use cheap compatible Deskjet 2549 inks is available for online buyers at some discount stores. The HP 2549 All-in-One colour inkjet printer uses a pigment black HP 2549 ink cartridge and a dye-based HP 2549 tri-colour ink cartridge to optimise print results for text or images accordingly. Output costs can also be reduced over time by using the Deskjet 2549 XL ink cartridges which last longer. Print speeds for the HP Deskjet 2549 are relatively slow and have been surpassed by newer multifunction models that also offer additional features, such as a fax machine.